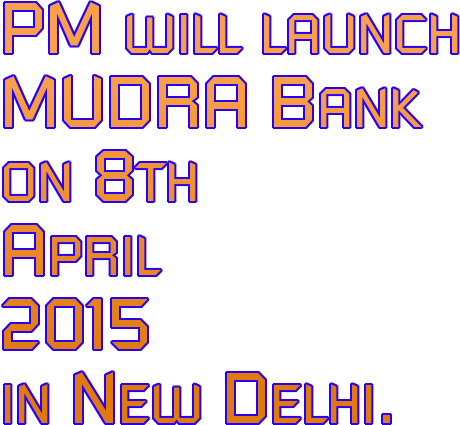 PM will launch MUDRA Bank on 8th April, 2015 in New Delhi. PM will launch MUDRA (Micro Units Development and Refinance Agency) Bank on 8th April, 2015 in New Delhi. Prime Minister of India Shri Narendra Modi will launch MUDRA (Micro Units Development and Refinance Agency) Bank on 8th April, 2015 at 9.15 AM at Vigyan Bhawan, New Delhi in the presence of Hon’ble Finance Minister Shri Arun Jaitley. In order to decide the modalities of functioning of MUDRA Bank, a meeting of stake holders consultation was held today in New Delhi under the Chairmanship of Dr. Hasmukh Adhia, Secretary, Department of Financial Services, in which all stakeholders, including cross section of micro finance institutions, NBFCs, Banks, NABARD, SIDBI and RBI representatives were present. Based on the consultation which took place today as well as the consultation which will happen in the days to come, the exact modalities of functioning of MUDRA Bank and its activities would be framed before the formal launch of MUDRA Bank on 8th April, 2015, and the same would be unveiled on the day of Launch.